my neighbors keep stopping me when they see me outside gardening or taking the dog for a walk. after they say welcome to the neighborhood, blah, blah, blah...the next thing out of their mouth is... do you know about halloween? 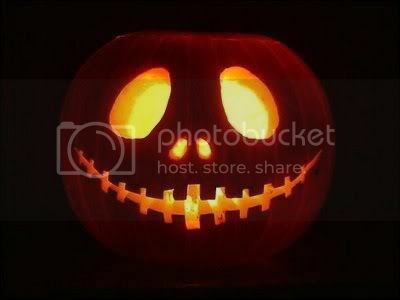 "halloween has roots in the celtic festival of samhain and the christian holy day of all saints. and samhain means summer's end so halloween is a pagan holiday to celebrate the end of the harvest and the beginning of the darker half of the year." and push my glasses further up my nose. but i don't because being sarcastic is probably not the best way to start being a good neighbor, so i say no, "what about halloween?" get this... my neighbors say, "expect a 1000 kids." now this above scenario has happened more than once, i have had a dozen of neighbors warn me. i decided to heed their warnings, i have bought 6 huge bags of candy. it fills a basket 2 feet long, 1 foot wide, and about a foot deep. i'm going to be pissed if i spent 50 dollars on candy and i get 2 kids. i'm going to egg their house with all my leftover candy! but i think they are serious because half the houses are seriously decorated to the hilt and i only have two pumpkins because someone keeps systematically stealing my pumkins one by one. spooooky! wish me luck and have a happy halloween! Happy Halloween! I would love a bunch of kids, we get about 30. Cross over children. All is welcome. All is welcome. I love seeing all the little ghosts and goblins. Halloween is really starting to take off here in Germany. I must have had 50 kids last year and this is a really tiny town. I am expecting more this evening. For the first time ever a Halloween parade is taking place in Kaiserslautern, our closest city, tonight. That sounds a little scary to me! Good luck! I wish that happened here. We get like 20. It's lame. I would totally say all those things!!! That is, if I didn't scare my neighbors so they don't speak to me. Nothing wrong with being a sarcastic b*tch! Oooh, the satin response is always a winner. You're right, though - not the best way to make new friends. Have a great one tonight! Well I guess I'm an exception to the rule here. We are getting fewer kids at the front door each year and I am glad. Somehow, between all the purchased costumes and kids who seem unhappy if you aren't handing out all chocolate stuff, a lot of the fun has gone. I got 2 big bags and will be unhappy if I don't hand it all out (unhappy and on a huge sugar high by 9:30 PM that is.) Good luck with the hordes! hope you got a lot of kids. this year our usually busy halloween was empty. my mom, a pediatrician, said that many people aren't doing it b/c of the flu. Soooo? Did you? I HAVE TO KNOW. Okay so did you get a 1000? I need to know! I'm curious too! Were you tapped out?